It’s beginning to look a lot like Christmas, and soon it’s going to be snowing in Okinawa. 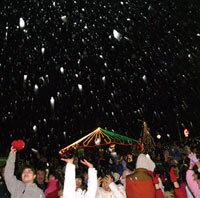 The year’s first snow will be December 22nd, the opening day of the 12th annual Okinawa Zoo Park Christmas Fantasy. The six-day holiday special event will feature a taste of real winter, as fantasy creators open a couple of kamakura snow cottages, a Japanese style igloo, to give everyone a chance to experience the cool feel of snow. Okinawa’s best known laser show is a part of the Christmas Fantasy, a skillful blend of lasers, fireworks, snow and soap bubbles. Okinawa Zoo Park will have three shows daily, at 6:20 p.m., 8 p.m. and 9:40 p.m. Organizers promise new and ‘specifically improved’ special effects featuring fire, snow and other variations at this year’s shows. It’s the snow, though, that acts as a magnet for thousands of visitors. It snows in Kodomo-no Kuni daily, offering a White Christmas complete with opportunities to build snowmen and have snowball fights. The snow forecast calls for the powdery white stuff to flake down daily at 4:20 p.m., 5:40 p.m., 7:30 p.m., and 9 p.m. As visitors enjoy the snow, they can also take in the daily Christmas Concert at 8:30 p.m.
Christmas Fantasy will run December 22nd ~ 27th from 4 p.m. to 10 p.m. Adult and high school student tickets are ¥1,700 in advance, or ¥2,000 at the gate. Children’s tickets for youngsters 4 through junior high school are ¥1,000 in advance or ¥1,200 at the gate. Tickets are available at MCCS Tours and Kadena ITT. Tickets are also available at all Family Mart, Hot Spar, Book Box, JUSCO, MaxValu and Lawson stores, Okinawa Zoo Park, as well as at Mitsukoshi, Ryubo Palatte and Ryubo Shuri department stores, Nakagusuku Mall, Hamby Flea Market area, All Coop stores, Denen bookstores, and Tsutaya Ginowan Branch. There’s parking available at Okinawa Zoo Park, and also at Okinawa City Office, Koza Sports Park and Awase Seaport. Shuttle busses will operate from the outlying parking areas to Okinawa Zoo Park. Eisa dance performances will be presented daily at 6:40 p.m., the Te-da family, a dance group filled with energy as they go through break dance routines, appear on stage daily at 5:10 p.m. and 7:10 p.m., and the Big Bingo Game Rally plays daily with opportunities to win stuffed animals, toys, bicycles, game software and more. There’s even an amusement area for the smaller kids, complete with merry-go-round, trampoline and other playground type equipment.